WhatsApp is widely used around the world. With the help of WhatsApp you will be able to easily send any text, audio, video messages to other WhatsApp users from your smartphone. WhatsApp is a great tool which is used to communicate with each other. There are lot of interesting features in WhatsApp which we already discuss in previous article. 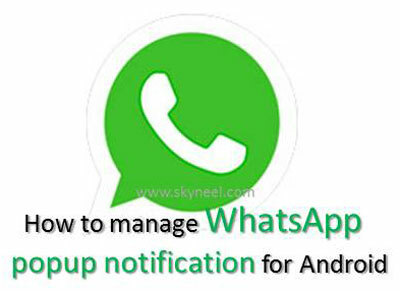 Today we have to discuss how to manage WhatsApp popup notification for Android phone. There are lot of features available on for the WhatsApp in your Android phone. But most of the person don’t know about these features. If we learn how to operate these features then it will be very easy for us to operate out smartphone. Do you know Popup notification is used to display all upcoming messages in an another popup window. With the help of WhatsApp you will be able to easily start voice calling to other WhatsApp user. This guide is helpful for all those WhatsApp users who will be disturb with the notification. You have to easily enable or disable notification after reading this article how to manage WhatsApp popup notification for Android phone. Most of the time when your phone is locked by any password protection and you got any message on WhatsApp then first you have to unlock your smartphone then you will be able to read the message. But after reading this article you have to easily read the WhatsApp message without unlocking the Android phone. If you want to manage WhatsApp popup notification for Android phone then you have to take following given steps. Step 1: Turn on your WhatsApp. Now tap on the three dots which is located on the top right corner of your WhatsApp window. Step 2: Tap on the Settings options in you active WhatsApp window. Step 3: Tap on the Notifications option. Tap on the Popup notification option on your Android phone. Step 4: In Popup notification window you will get different options, now you can choose any required options as per your need. No popup: By default this option is already set in your WhatsApp window. This option does not provide any kind of popup notifications. Only when screen “on”: If you want to choose this option then you will get popup notification only when you Android phone screen is ON. Only when screen “off”: If you want to view the popup notification when your phone screen is locked and you want to check the notification without unlocking the phone, then you must choose this option. This option provide the popup notification when your Android phone screen is off. Always show popup: If you choose this option then you will always get the popup notification on your Android phone. I hope after reading this article you will be able to understand how to manage WhatsApp popup notification for Android phone. If you have any suggestion regarding this article then write us in the comment box. Thanks to all.